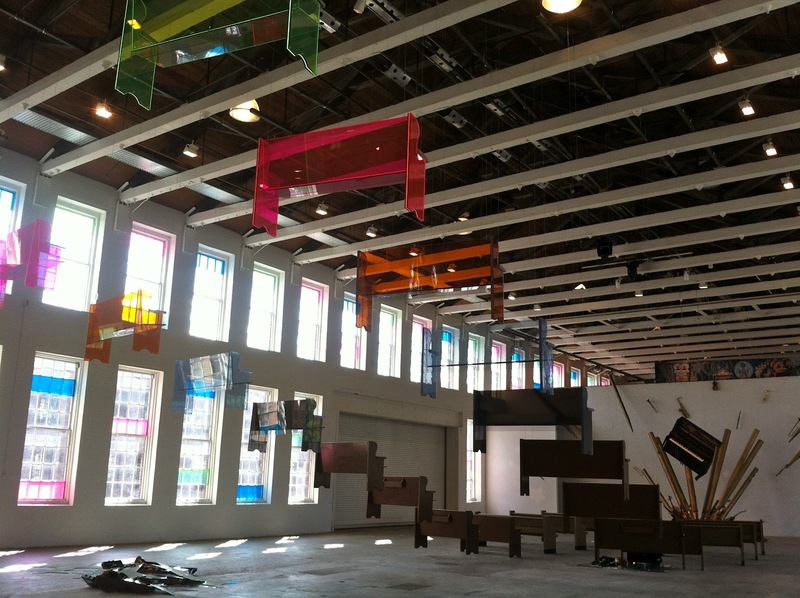 Sanford Bigger’s installation at MASS MoCA, “The Cartographer’s Conundrum” offers a journey I highly recommend taking. The space for it is arguably a bit bigger than it needs to be, but considering the scope of the piece, it worked for me. 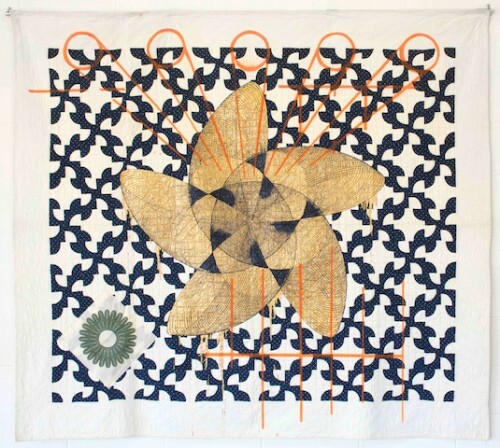 Large tetrahedrons like patterns on a quilt are constructed out of basic floor linoleum often found in churches. 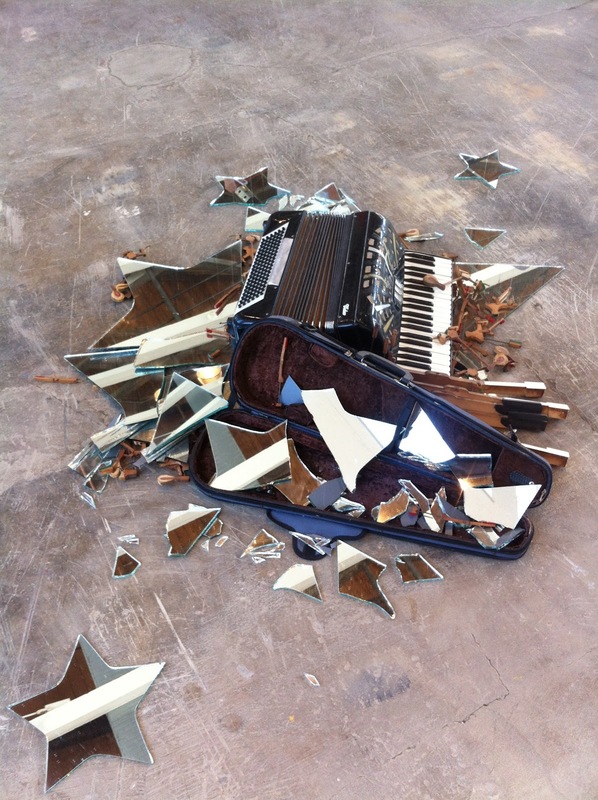 Stars of many sizes cut out of mirrors lay in rough broken piles, which, in conjunction with slightly mangled musical instruments, look like they might have been mysteriously ejected from a wind tunnel. The star’s reflections are musical notes rising towards the sky. As you continue your journey, sounds of spiritual Brazilian music emanate from the wall and light passes through bright colored plexi. Sacred geometry gets more sacred when you reach pews that gradually descend from the heavens, and change materials from brightly hued Lucite to a traditional wood. What continues throughout the entire install, are the mangled instruments and shattered stars. 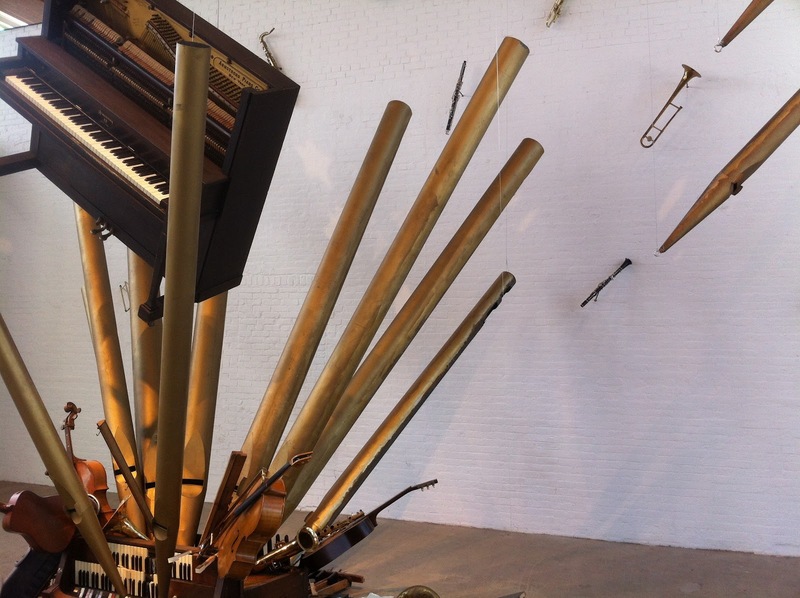 When you arrive at the final row of grounded pews, you become witness to a kind of rumpled up Mothership (borrowing from P.Funk), comprised of shattered instruments and stars, where instruments parts speared through space and their meteoric parts lodged into the ground, or alternatively, they exploded outward and landed like a knife thrower’s daggers into the walls. 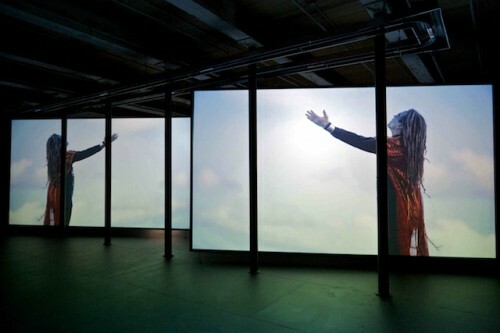 In an adjoining room, there are two very large screens, which play the video from his “Cosmic Voodoo Circus” installation, “Shake” mirrored, consistent with the symmetry of the pews in his ‘cosmic slop’ of splattered stars and pianos. One flashback has the Brazilian artist walking into a coffin shop, where he randomly steals what appears to be a red and gold detailed, Indian sari. In another cut, he is in a bar with staggered hallucinations of himself in a sort of minstrel performance. In addition to being rich in color and texture, it has a musical quality to it, like his oceans filmed in reverse. I stood transfixed in a dark room watching this man, Ricardo Castillo, with silver painted face and high heeled silver boots, with outstretched arms reaching to the heavens, and it was moving without even knowing what I should be feeling and why. Admittedly, when I first walked through the installation, I missed the reference to quilt patterns with the linoleum flooring. After it was pointed out to me, it was impossible not to think about it, and of course, by the time you reach the final room of the installation, on the top lofted floor, there is an enormous reproduction of Sanford’s cousin, John Biggers’ painting, “Quilting Party”, 1980-81, together with a quilt upon which Sanford painted patterns that are like cosmic trajectories from the installation below. I’m hardly scraping the surface of what invariably is an intricately woven tapestry of afro-culture, with texts and subtexts and allusions of illusions. I stumbled into the “Conundrum” and lost myself. It felt a little like going to an extravagant place for a three-day vacation. With so much to see and not time to see it all, I savored and took in what I could. And for that I feel richer and won’t soon forget it. What a great sounding show and post. I particularly was struck by your comment on how the floor pattern distracted you from what was before you and its pattern. The fact that once you realized it, you refocused probably with greater clarity than might have been the case. Isn't that what wonderful art is all about!